For other people named Alberto Fernández, see Alberto Fernández (disambiguation). Alberto Ángel Fernández (born April 2, 1959) is an Argentine politician. He was the Chief of the Cabinet of Ministers during the entirety of Néstor Kirchner's presidency, and the early months of Cristina Fernández de Kirchner's. His tenure as Cabinet Chief from 2003 to 2008 remains the longest since the post was created in 1994. Fernández was born in Buenos Aires, where he would later attend Law School at the University of Buenos Aires. He graduated at the age of 24, and later became a professor of criminal law there. He entered public service as an adviser to Deliberative Council of Buenos Aires and the Argentine Chamber of Deputies. He later as Deputy Director of Legal Affairs of the Economy Ministry, and in this capacity served as chief Argentine negotiator at the GATT Uruguay Round. Nominated by newly elected President Carlos Menem to serve as National Superintendent for Insurance, served as President of the Latin American Insurance Managers' Association from 1989 to 1992, and co-founded the Insurance Managers International Association. He also served as adviser to Mercosur and ALADI on insurance law, and was involved in insurance and health services companies in the private sector. Fernández was named one of the Ten Outstanding Young People of Argentina in 1992, and was awarded the Millennium Award as one of the nation's Businessmen of the Century, among other recognitions. During this time he became politically close to former Buenos Aires Province Governor Eduardo Duhalde. 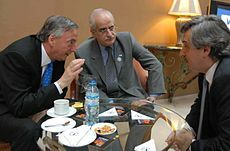 Fernández (right) with President Néstor Kirchner and Foreign Minister Jorge Taiana in 2007. A new system of variable taxes on agricultural exports led to the 2008 Argentine government conflict with the agricultural sector, during which Fernández acted as the government's chief negotiator. The negotiations failed, however, and following Vice President Julio Cobos' surprise, tie-breaking vote against the bill in the Senate, Fernández resigned on July 23, 2008. He was named head of the City of Buenos Aires chapter of the Justicialist Party, but minimized his involvement in Front for Victory campaigns for Congress in 2009. Fernández actively considered seeking the Justicialist Party presidential nomination ahead of the 2011 general elections. He ultimately endorsed President Cristina Kirchner for re-election, however. Wikimedia Commons has media related to Alberto Ángel Fernández. ^ "Clase Magistral". Univerdsidad Nacional de San Luis. Archived from the original on 2013-10-22. ^ "El Pasado Menemista de un gobierno que acusa a la oposición de menemista". Perfil. Archived from the original on 2008-04-17. ^ "Alberto Fernández habría vuelto con su esposa". Agencia Nova. Archived from the original on 2016-03-04. Retrieved 2013-06-23. ^ "Alberto Fernández y Vilma Ibarra más juntos que nunca". Perfil. ^ "Miguens afirmó que Fernández fracasó en la negociación con el campo". Los Andes. ^ "Kirchner cargó contra Cobos y De Narváez en un acto porteño". Clarín. ^ "Alberto Fernández reiteró que no descarta ser candidato a presidente en 2011". La Nación. ^ "Alberto Fernández se declara oficialista y ya se anota como candidato para 2015". La Nación. This page was last edited on 8 December 2018, at 02:33 (UTC).